Her financier husband is treated and released as the harbor collision of a water taxi and pleasure boat is investigated. 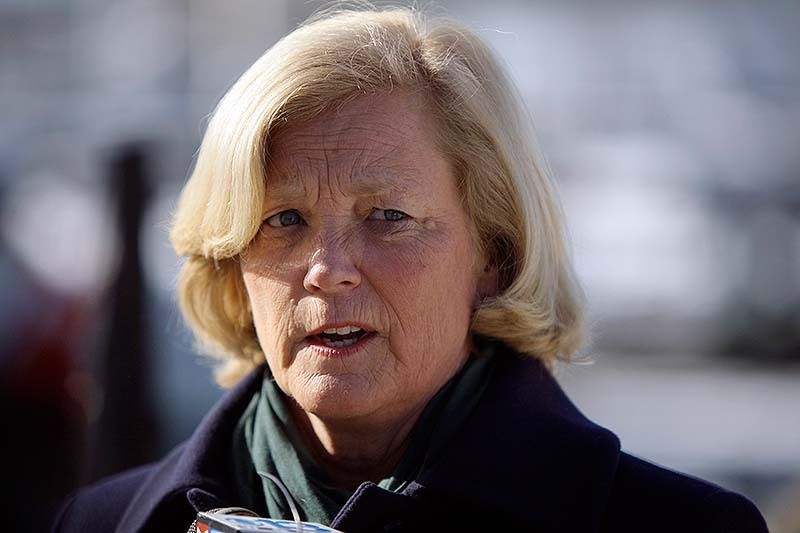 PORTLAND — A water taxi carrying U.S. Rep. Chellie Pingree collided with a 20-foot recreational boat Saturday night in Portland Harbor. Pingree escaped injury, but three others were hurt, including her husband, Portland financier S. Donald Sussman. Willy Ritch, a spokesman for Pingree, said Sussman, 67, suffered a head injury and numerous cuts and bruises. He was transported by the Portland Fire Department to Maine Medical Center, where he was treated and released early Sunday. Ritch said Sussman and Pingree returned to their home on North Haven, an island off Rockland in Penobscot Bay. Officials said they received a call from the water taxi around 10:14 p.m. reporting the collision near Fort Gorges. Crews aboard two of Portland’s fireboats responded and took about 20 minutes to locate the damaged boats, said Deputy Fire Chief Robert Wassick. They found all of the passengers were conscious, but two of the seven people on the water taxi and one of the two people on the pleasure boat were injured. The pleasure boat passenger, Sally Handy of Boulder, Colo., was the most seriously hurt, said Maine Marine Patrol Officer Scott Couture, who also responded to the crash Saturday night. She was taken to Maine Medical Center, where a nursing supervisor said she was in fair condition Sunday evening. Jackie Potter, a former Pingree staff member who was on the water taxi, suffered minor injuries. She was treated at Maine Med and released. The crash occurred while Pingree and Sussman were aboard the Bay Express, owned by Portland Express Water Taxi. They had attended the wedding of one of Pingree’s former staff members on Great Chebeague Island. Sussman is the majority share owner of MaineToday Media, which owns the Portland Press Herald, Kennebec Journal and Morning Sentinel. The group on the water taxi also included Bill Black, Potter’s husband; Jesse Connolly, Pingree’s chief of staff; Nicole Clegg, Connolly’s wife and a spokeswoman for the city of Portland; and the pilot. Handy and Christopher Pizey, the owner and pilot of the pleasure boat, were headed back from downtown Portland to Peaks Island, where Pizey lives, the Coast Guard said. 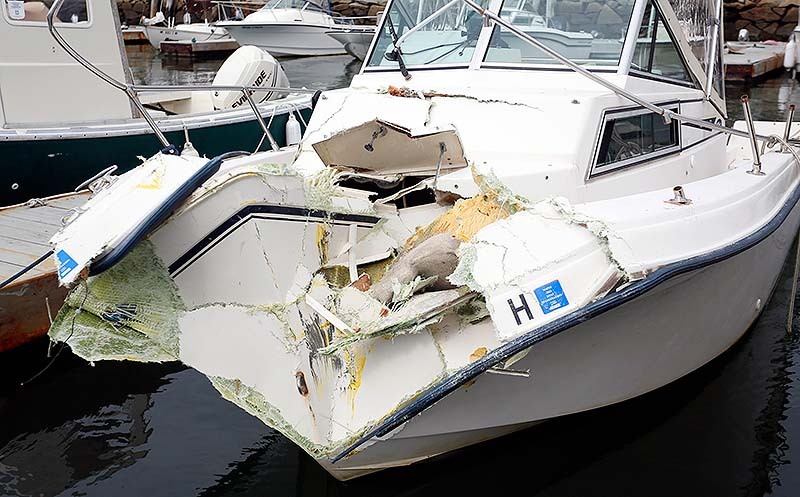 His boat, the Miss M, a Grady White Overnighter 20, was seriously damaged, with its fiberglass bow caved in above the waterline. The extent of damage to the water taxi was unclear. The Coast Guard will examine both vessels in more detail Monday. Chief Petty Officer Matt Burt said the water taxi cannot return to service until the Coast Guard has inspected it. In a statement issued Sunday night, the Coast Guard said breathalyzer tests administered to the operators of both vessels were “negative.” But other factors, such as speed and whether each boat had its running lights on, remain under investigation. The Coast Guard declined to identify the pilot of the water taxi. Burt said weather conditions at the time of the crash were calm. Skies were clear, the wind was 5 knots and seas were flat. In a written statement, Pingree thanked the first responders. “Although it was a scary night, it could have been much worse if it weren’t for the skill and dedication of everyone who responded to the accident,” she said. Couture, who is assisting the lead U.S. Coast Guard investigators, said he couldn’t discuss what may have caused the crash while the investigation is ongoing. At a news conference Sunday at the Coast Guard boathouse in South Portland, Lt. Scott McCann said investigators are looking into whether proper lights and safety equipment were being used and whether environmental issues may have been a factor. McCann said that between dusk and dawn, boats are required to illuminate at least red and green lights on their port and starboard bow and a white light on the stern. Water taxi pilots are required to be licensed. McCann said he did not know how fast the boats were moving. If anyone is found to be at fault, the Coast Guard is the agency that would file charges, he said. Both the Bay Express and Miss M were able to return to shore in Portland under their own power, officials said. The Bay Express was moored at DiMillo’s Marina and the Miss M at Portland Yacht Services, the Coast Guard said. The owner of Portland Express Water Taxi, Capt. Gene Willard, could not be reached by phone at the taxi service Sunday and did not respond to an email. None of the passengers aboard the Bay Express or the Miss M could be reached for first-hand accounts of the crash. Ritch said Pingree did not want to comment beyond the prepared statement he released on her behalf.